In conjunction with the launch of the Nurita Harith x Petronas grid girls uniform for the upcoming Malaysian Grand Prix, Mercedes-Benz Malaysia decided to wheel out the facelift for the R172 SLK, otherwise known as the SLC. Previously, we only managed to spot the updated two-seat roadster in SLC 300 guise, but this is our first clear look at the base SLC 200. Under the hood, it gets a 2.0 litre turbocharged engine, with 180 hp and 300 Nm on tap, send to the rear wheels via a 9G-Tronic automatic transmission. 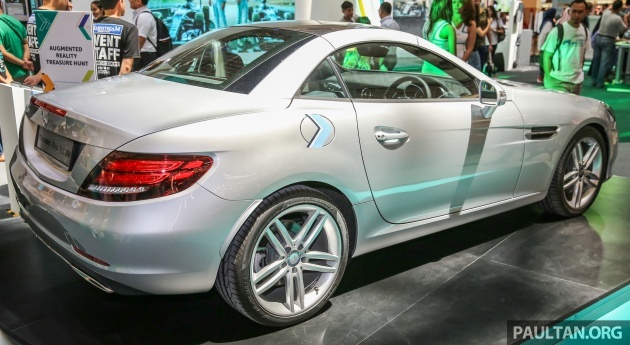 Exterior changes over the pre-facelift SLK include reshaped headlights, new front and rear bumpers and redesigned graphics for the taillights. As for the interior, the SLC gets the latest Mercedes infotainment systems – including a COMAND Online option – as well as a new three-spoke steering wheel. In terms of specifications, the SLC 200 gets LED Intelligent headlamps and 18-inch five twin-spoke alloy wheels (which comes with the sports package that also includes sports suspension). It also gets the Airguide wind deflectors but not the Magic Sky Control panoramic glass roof. Additionally, the car seen here doesn’t sport the optional AMG Line package, which includes more aggressive bumpers, a diamond grille and multispoke rims. With the launch of the new Mercedes SLC imminent, read up on our review of the roadster – in AMG SLC 43 guise – here. The old AMG line wheel more nicer, power wise old one more hp but lower torque than this (small margin oni).. that one just simple fix just dump in kleeman chip to get more hp and torque. the rest can retrofit to the facelift version. next to the SL, this is probably the ugliest car in the mercedes line up. time to end its misery! Although the interior has improved, the exterior still looks cacat and out-of-proportion in my opinion. 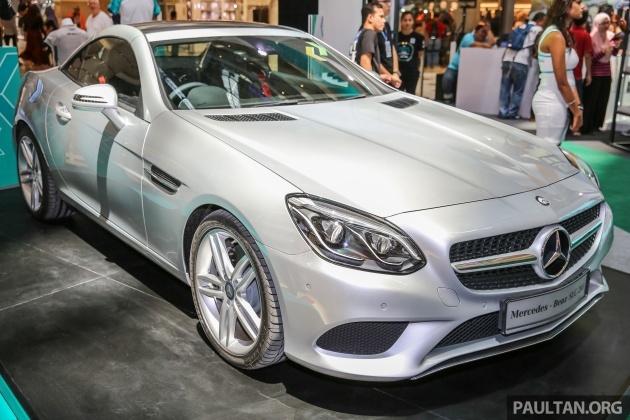 Worst MB design after the W168 A Class and W203 C Class Coupe. Google up and you will see the world also agrees with me. Gerard, does this SLC roof fold down & become a cabriolet ? If it does, U are buying 2 car into 1 package for the price of 1. It looks like a scale down SLK. Yes, it’s a folding hard-top. The SLC replaces the SLK.